The morning rally itinerary is a guided walking tour of Salviac. We start at the church (Salviac is on one of the many pilgrim routes to Santiago de Compostella – is there any town in southern France that is not?). Our guide gives a comprehensive tour of the church interior that goes on and on. John cannot follow his words and after several hours Sheila also loses the will to translate. Some of the French tandemists drift outside and, realising that the only way to bring this part of the tour to an end is for our guide to have no one left to talk to, we do likewise. We then take in the fountain and a newly restored medieval garden, which is quite charming. The château is privately owned and Bob, who has been inside once, describes to us the lavishly decorated rooms each with its own exotic theme. As we stand there the châtelaine comes home and we are all invited into the courtyard to have a look. Discovering that there are some Americans in our group (= wealth?) she is eager to let us know that the château is for sale and she is open to offers. The formal start to the rally is after lunch. We are given badges and goody-bags with bottles of wine, lots of information booklets, a small silver rally dish, two bottles of wine and a jar of pâté – most of which we won’t be carrying home. We take some photos in front of the rally banner and set off for the inaugural led ride. Only 28km, but on small lanes and in parts seriously steep and/or gravel or grass in the road making it challenging to us on the only three-wheeled vehicle. After a very short way we stop at a vineyard (Vin de Domme) where there is a new and very high observation tower that one can climb. We note that there are 50 of us on the rally and the tower is restricted to a maximum 20 people at one time, but this does not seem to concern anyone else. There are see-forever views (and a breeze) at the top. Continuing for about 200m we reach the winery itself and head in for a tour and the offer of wine tasting / purchasing. Continuing for at least another 1km we stop at a saffron growing establishment to partake of saffron and peach sorbets, which in the heat of the day are welcome and excellent. It may be a short ride, but at this rate it could take a long time. After a bit of strenuous riding including some serious hills and bumpy descents we stop at the Jardin la Dadaille, which is a garden a now elderly English couple have been creating, carving it from the hillside for many years. They used to run their property as a restaurant, but now just open the garden and do teas. Some of the French tandemists arriving after us report that they had observed our bananas (which John had bungeed to the rear rack) fly off the trike and head into moon orbit on one particularly exciting rough descent. From here we head back to Salviac. Once on a proper smooth large road we enjoy engaging the large ring and winding up the trike for a luggage free blast home. The rally dinner takes place tonight in the church square opposite the Auberge. It is a buffet provided by the Auberge. We sit at a table with the English speakers (and some others) and enjoy a good meal and lots of bonhomie. And, remarkably for France, no speeches – just one short announcement by Bob about where and when to meet tomorrow and the choice of self-led rides available. Throughout the morning we overtake or are overtaken in turn by tandems as we progress, with all of us coming together for the casse-croûte and lunch. The route is marked with paper arrows stuck to the road, apart from one junction near to the start where we and several others whizz by the turn. Luckily Sheila was alert and looking at the map so we only had to retrace a short way. Lovely scenery and we enjoy shooting down the hairpin drop into Catus, which we had climbed previously. Catus leads us into the plan d’eau where the casse-croûte is set up. We point out to Carl that a true French randonneur would head straight for the red wine, which he does, while we stay on the soft drinks, apricots, cake and chocolate. A bit of lounging around, a few ATQs and some photos of Bob and Mary on the trike. The journey on leads us to the Col de Crayssac, where we stop beside Bob, Mary and Johanna who have gone on ahead from Catus in their car. We take in the view and then descend the twists and turns to the valley floor, accomplishing this much quicker than the ascent took us two days ago. A gentle ride beside the river brings us to our lunch stop in Castelfranc. We are early so we settle in a café beside the bridge for pre-lunch SdM&C and watch other tandems arrive. Lunch is well organised on tables in the shade beside the market building. After a relaxing break we set off again into the very strong heat of the afternoon. We have some tough cycling to come climbing out of the Lot valley and then ‘over the top’ to Salviac so Sheila instigates the 5km rule. After each 5km we stop in the next available spot of roadside shade to stand up, drink and have a 2-minute cool down. As we go along we leapfrog the couple adopting a similar tactic on the Hase Pino. Eventually we reach Cazals and the welcome sight of a roadside café. We pull in for ice creams, followed by SdM&C. Others join us. From here it is a short run home and into the shower. With the early evening sun still strong we walk down to the campsite café for pre-drink drinks. More SdM&C. Then we join Martine and Benit and all the others for a vin d’honneur, speeches and prize giving in the salle de fêtes. The speeches are commendably short; and the prize giving comprises awarding silver salvers (standing on hefty wooden bases) to the tandems who have come furthest in the world, Europe and France to attend the rally. Carl and Julie win the first award as their USA state is just further from France than those of the other Americans. On receiving their award Carl drops to one knee, proposes to Julie and produces flowers and a ring. Luckily the slightly surprised and confused Julie says, “Yes”. Bob and Mary had let us in on this in advance and we are all relieved it has gone well. The French want to be sure she has said, “Oui” and when reassured applaud loudly and with enthusiasm. 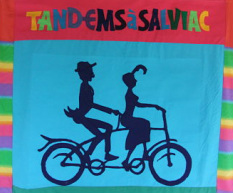 We are then awarded the Europe prize, which is a walkover because we are the only non-French or American tandem. But we don’t feel too bad because we have easily cycled the furthest distance to be here, having pedalled a circuitous route from Sault. Finally, the French award is given.